The Swiss city of Lausanne was the venue for the fourth International Workshop on System and Concurrent Engineering for Space Applications (SECESA 2010) jointly organised by ESA and the Ecole Polytechnique Federale de Lausanne (EPFL). The workshop has proved to be an excellent forum for system engineers and specialists working within concurrent engineering environments to discuss common problems, show new software and methodologies and to see the direction being taken by others in the space engineering community. The workshop also gave an opportunity for system engineers to exchange experiences, know-how and lessons learned of applied system engineering (SE) in system design and implementation, sharing showcases and results of new methodologies. The workshop was attended by more than 150 participants including ESA Partners, European Space Agencies, Industry, Academia as well as international representatives of the space community. Of course the location of the workshop in a University campus allowed many students from EPFL to join in. ESA, as a leading proponent of Concurrent Engineering (CE) presented a number of papers at the workshop as well as practically demonstrating the new Open Concurrent Design Server (OCDS) shortly to be rolled out to ESA partners as community software. New Processes and Methodologies for System Engineering (SE) for Space and Non Space Applications was a very broad spectrum session, covering subjects from LEAN Engineering and lifecycle assessments when applied to concurrent engineering to a presentation on rapid mission architecture from NASA/JPL. The session finished with an invigorating presentation about CE design applications in non-space environments including a fascinating project involving farming flatfish. Session 2, SE & CE Space Applications: From Small Satellites to Complex Systems was a more traditional session, with excellent papers giving examples of on-going studies as well as the first applications in the new Agenzia Spatiale Italiana (ASI) Concurrent Engineering Facility (CEF). A. Ivanov gave a very interesting presentation on the modelling of nano and micro satellites at the EPFL Space Centre and the session ended with a presentation on the newly created System of Systems architecture in the ESA CDF. These sessions were preceded by keynote speeches. The first, by Marzio Nessi of CERN, was a superb talk on the ATLAS experiment and the large scale engineering projects associated with the CERN Large Hadron Collider. The second keynote was from Marco Lisi, from ESA Navigation Directorate, about engineering a service oriented system for Galileo. Session 3, CE Infrastructures, Services and Facilities covered presentations from various CE facilities within Europe including the International Space University (ISU), German Aerospace Center (DLR), Thales Alenia Space (TAS), as well as the Brazilian Institute of Aeronautics and Space (IAE) whose presenter unfortunately did not arrive in time. This did however allow extra time to view the poster session which was on display throughout the workshop. Session 4 was about SE&CE tools and models and ranged from the new 3D System Management Tool used in the TAS CDF to integrate tools from various disciplines into a common environment to a paper investigating the effect the amount and level of detail of technical information has on the cost estimating process. It was interesting to see the solutions people are finding to common problems and the depth of questioning after some presentations showed the level of interest in this topic. The keynote speech during this session was from Mark Adler NASA's Jet Propulsion Laboratory (NASA/JPL) on the recent directions in CE at Team X. This introduced the term Social Engineering, a subject we will surely hear more about in the coming years. Session 5 covered Standards and Enabling Technologies and included a presentation on the Symphony Study which is extending the capabilities of the Open Concurrent Design Server (OCDS) from TAS France. This was interesting particularly as it coalesced with the OCDS demonstrations held on the first two evenings of the workshop in the EPFL Space Centre CDF. 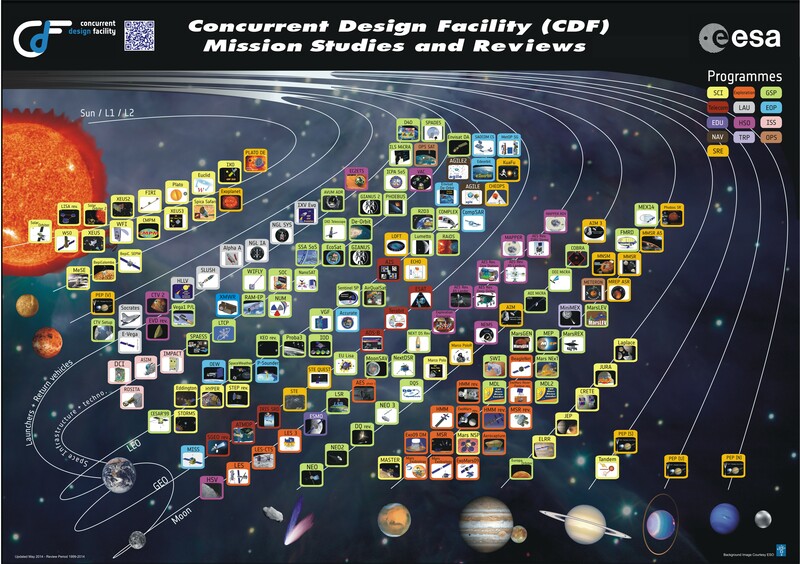 NASA/JPL gave a presentation addressing concept maturity in the early formulation of unmanned spacecraft and explained how they approach the design based on this Concept Maturity Level (CML). Session 6 focussed on Model Based System Engineering (MBSE) for Space Applications and included a number of very interesting presentations on modelling methodologies and object oriented system models as well as the evolving European Cooperation for Space Standardisation (ECSS) supporting MBSE. This time, the keynote speech was given by Dave Nichols of NASA/JPL on infusion strategies for MBSE in robotic space exploration, which discussed the cultural changes required to an organisation to move to MBSE. Session 7 covered Lessons Learned and Knowledge Management and ranged from an introduction to the Mission Design Centre at the Japanese Aerospace Exploration Agency (JAXA) to a new knowledge management system, suitable for SE and CE, presented by DLR. One of the benefits of holding the workshop in Lausanne was that the workshop dinner could be held in the spectacular Musee Olympique where a splendid meal was served, set amongst an impressive display of Olympic equipment and medals, with lots of screens showing highlights of past Olympics. It was definitely a unique experience. Maurice Borgeaud (EPFL) - We are very happy to be hosting this workshop as we realise that it is important for our students to not only be specialised in one domain but to have a broad knowledge. We are trying to produce engineers able to enter the market place totally equipped to meet the requirements of industry and system engineering is a prerequisite. Mark Adler (NASA/JPL) - It is amazing to see the number and diversity of applications to which CE is applied in Europe. Although Team X was started 15 years ago we still have things to learn and there are definitely things we will be taking back from this workshop that will be used in Team X.
Dave Nichols (NASA/JPL) - It is great to see the international space community of concurrent engineering get together and also to see how this knowledge is being used outside the space community. Michel Courtois (ESA) - The benefits of holding these workshops in Universities is that we need to find high quality system engineers and the best way to get them is to expose them to this sort of environment early in their careers preferably at University where they can learn what is required as well as understanding the teamwork and other social skills required to become effective system engineers. Heinz Stoewer (TUD/SAC/INCOSE) - The vision that “the future of Systems Engineering is model based” is progressing step by step. This workshop transports the message and moves the community forward along a complex and rocky path.